For many January is the time when resolutions are made and goals for the new year are set. I’ve made only one resolution this year to start each day right. So far, because of circumstance, I’ve not being doing this as I had planned, but I won’t give up on that, I know it will take little steps. As a couple, we have resolved to manage our finances and budget more effectively. We don’t do too bad a job at this, and we have our clear defined roles when it comes to how we spend our income. He takes care of the necessities in life – utility bills and mortgage; and I take care of the fun things in life, like our car repayments, holidays, days out and treats. We share the responsibility of groceries. It’s the way we have been rolling since we got married and it works for us. In this current climate of financial uncertainty we recently re-mortgaged to not only get a better deal than our current rate, but also to opt for a fixed rate mortgage. This way, we’re secure in the knowledge of knowing that if interest rates do start to rise in the next year or 2, our payments will remain unchanged which means we can still keep to our budget without hopefully any nasty surprises. There are online tools like TSB’s mortgage repayment calculator that you can use to find out how much money you can potentially borrow. Tip #1 – Assess the type of mortgage you are currently on and whether if switching could save you money each month. We make use of various comparison websites to see what the best deal available is, and I’m not scared about changing providers! We also try to be more energy efficient around the house, like not leaving electricals on standby and switching off lights once we’ve left a room. We have cavity wall insulation and the loft is insulated too which minimises the amount of heating we need to use in the colder months. Tip #2 – Use utility comparison websites to make sure you are getting the best deal for your electricity, gas, phone, broadband, insurances etc. We start each week with a meal plan so we know what to buy, and thus, not spending money on food that will go to waste. Tip #3 – Write a meal plan each week to help you shop smarter and not waste money on buying food you won’t use. We do the grocery shopping online and collect it from the store, that way we can see what we are spending in advance, and not tempted by special offers that we really don’t need. It’s very easy to become swayed by product placement in supermarkets! We only take up on special offers like 3 for 2 when we know that it’s a product that we will use, and of course, make sure we pick up the free ones when there is a BOGOF! Tip #4 – Only take up on special offers if you know you are going to use the products! If it’s just going to end up in the bin because it went out of date, it was a waste of money! Another thing we do every so often is “shop our kitchen”, because, invariably there will be times when we’ve got food languishing at the back of the cupboard or at the bottom of the freezer, and it’s amazing what meals you can make! There have been times when all we’ve needed to buy the basics like milk and fresh veg/fruit. Tip #5 – every week/month go through your store cupboards and fridge/freezer to see what food items you can use that week in meals, you may be surprised what you find! This will save you money on your shopping bill. My husband has a full time salaried job, I, on the other hand am self-employed and have been for coming up to ten years. This means that it is always down to me to make sure I meet my income goals each month. I know the things that I must pay out for each month – car repayments for example, and other financial commitments; I also know how much our annual holidays cost (since holidays are my domain, I’ve also written a post with my top 10 holiday budgeting tips that you may find helpful) so I divide that total by 12 to give me a monthly figure. This gives me the very minimum that I must earn each and every month – without fail! I then double that and aim to hit that target at least every other month – this then pays for all the other treats we can enjoy as a family, like days out, celebrations, things for the home etc. It is the system that works well for me, and gives me something to strive for! Tip #6 – Put a fixed amount into a savings account each month to go towards things like birthdays and Christmas – and make sure it’s the best savings account that you can get in terms of interest rates! Tip #7 – Make use of cashback websites and voucher codes when buying things online – it’s amazing what you can save! Tip #8 – Set up a spreadsheet to help you track your daily/weekly/monthly spends; this can really help you to manage your finances and see where changes can be made if necessary. Tip #9 – Pay off outstanding debts, especially those with high interest rates; consider switching to a 0% credit card if you can. Tip #10 – Have an emergency contingency fund. There will be times when you need to pay for something unexpectedly, so ensure you have money when you need it by putting a proportion of your earnings into savings for those rainy days. 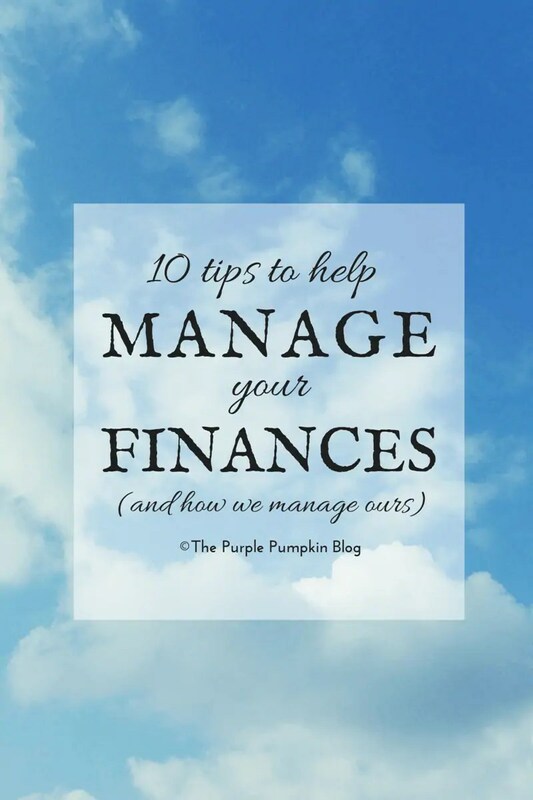 I hope that our tips to help manage your finances will be useful to you. How do you manage your finances? Are there any tips you can share? Let me know in the comments section below this blog post.